Dynamics NAV 2013 comes with a completely redesigned development experience. One of the nicest new features is the innovative debugger. When I was looking for information that covered the new debugger, I found a lot of small articles that simply said it was more powerful and would debug any c/AL code. I wanted to understand it more, so I installed it to play with. I understand that not everyone has that luxury so I wanted to write a more in depth article to help you decide if it is truly worth looking at. Even if you are not a developer, this feature could prove valuable to you and should be considered when comparing new systems or when taking into account an upgrade proposition. The features in this debugger will drastically cut trouble shooting time and help to identify issues quickly. The first indication of the power of the redesigned debugger is that it allows you to choose what session you would like to debug. This opens up the ability to debug any C-Side code anywhere in the application. This includes pages, reports, and xml ports and gives you the ability to debug objects running under any user (including the application server). If that doesn’t excite you enough, check out the walk through of this fantastic tool and see what it can do. This will bring up the Session List window shown below. · if SQL Tracing is enabled [Session 8] (SQL Tracing is covered at the end of this post). If there was already a break point set, the user could not just move through the code until they hit the break point. The options shown in [Debugger 2] are to step into, step over, and step out all pertain to functions that you are currently in when sitting on a line. They are pretty standard with any debugger and not new to the debugger in 2013. The same goes for the options in [Debugger 3]. Continue starts the code and continues to the next break. Break will stop the code at the next statement and is good to turn on when you are sitting in a position on a page and just want to know the first thing to run when you start and action. Stop, stops the entire debugging session. 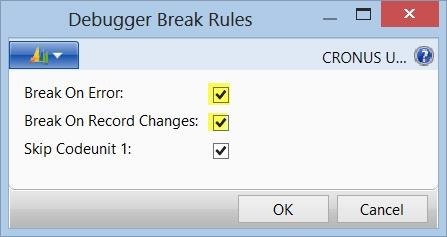 In addition to any break points that are set, Break Rules [third option in Debugger.4] are additional options for when to break in code. The rules are Break On Error, Break On Record Changes, and there is a checkbox to indicate if you want to debug codeunit 1 or not. Skipping codeunit 1 is important when walking through code. It prevents you from having to run through all the system and change log checks so you can simply step through the code block you are concerned with. 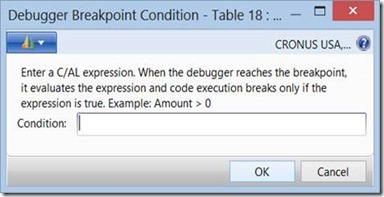 The next option in [Debugger 4] does exactly what it says, it disables all the current breakpoints you have set. An easy button when you want to continue to the end but you do want all the code to execute so you don’t want to cancel your debugging session. 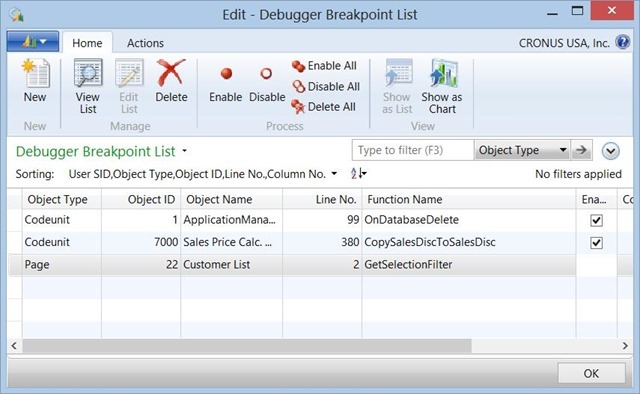 The final option in the [Debugger 4] set of options is the ability to show a full list of all breakpoints currently set. This is done with the Break point list (Shown to the right). The options are self-explanatory and all do exactly what they say. This is a very nice feature to be able to manage all of your break points and enable/disable different ones with each run through the code. Just the ability to see them all in one single list makes debugging much more transparent and straight forward. No longer do you need to run the code to a break point then disable it when you do not think you need it for this run. In addition, if you do happen to know the object and line number you wish to set a breakpoint on, you can also add a new break point within this list. So that takes care of our debugging options when we know the session we want to debug but what happens when we need to debug a web service call into NAV or a NAS session? Well, that is where [Session 3] option comes into play. It says debug next and it is used to debug the next session that comes on line. So if you want to debug a Web Service call, you will need to find a time when you can isolate the calls in and then turn this on, start your web service call and it should be the session caught. Same for NAS or any application that uses session start, just isolate the db, then start the service or process and capture the next session that appears. With 25 development sessions over the course of the day, participants joined together to learn from leading industry experts and share professional discourse in a number of areas. With session tracks on Architecture, Game, Mobile, Web and Windows 8, the Cowtown Code Camp sessions covered a wide range of topics that are pertinent in today’s technical world. From talks dedicated to leveraging new API’s for easier development, to creating next generation mobile apps, Cowtown Code Camp offered something for everyone. Microsoft also hosted a Lounge area, where they answered developer questions about the Microsoft Stack and the Window’s Store, and demonstrated development for Windows 8.